What does a fuel pump do? The name says it all. The fuel pump will pump fuel from the fuel tank to the engine of a car. The human heart pumps approximately 1.4 gallons per minute into the body. Thankfully, for both the environment and our wallets, a fuel pump in a car pumps nowhere near that amount into an engine. That’s not to say car fuel pumps do not work hard. From the moment you turn your key, the fuel pump in tank is at work. 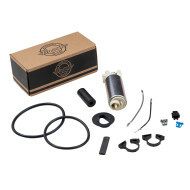 This is because the automotive fuel pump is one of the key components needed to start your vehicle. What are the symptoms of a bad fuel pump? The most obvious one would be the car engine will not start. This usually comes after common warning signs are ignored. These warning signs consist of, but are not limited to a sputtering engine, decrease in gas mileage, and intermittent accelerations. Where is the fuel pump? An in tank fuel pump is located just where it says, in the tank, sometimes mounted on top. There are also in line fuel pumps that are in the fuel lines themselves. There are different types of fuel pumps. Fuel pumps for diesel will be very different than a gas fuel pump. Diesel is made from a much lower grade fuel, whereas gasoline requires more processing to create a cleaner fuel. The main difference is in the two engines themselves. A gasoline fuel pump will pump gas into the combustion chamber where it is lit by a spark plug. A diesel fuel pump will pump fuel into a heated, high-pressured air that automatically combusts. So, a 2005 Nissan Altima fuel pump will be dramatically different than a diesel 2000 Chevy Silverado fuel pump. The cost of replacing a fuel pump in today’s market can be thousands of dollars depending on the vehicle. Fortunately, we have a solution for that high fuel pump replacement cost. Anyone can offer cheap fuel pump prices but only Everyday Auto Parts gives you not only the lower cost, but the quality you and your vehicle deserve. After all this, I’m sure you just want to know how much is a fuel pump? The prices of fuel pumps vary based on the year, make, and model of the vehicle. We recommend you put your vehicle’s information in and search out the pump of your needs. As an authorized retail supplier of Brock brand, we provide quality long-lasting fuel pumps for cheap… need we say more?